Now, I’d like you both to answer this question separately: One of the things I’m curious about is how you would recommend Professor Layton vs. Phoenix Wright: Ace Attorney, both to fans of the two series and to new players? What would your message to the two groups be? Well, my message to fans of Professor Layton would be that they don’t have to worry – this is a title they can enjoy playing as though it were a new title in Professor Layton series. I think that by adding characters from Ace Attorney to the mix, we’re allowing the Professor’s playful nature to come to the fore, revealing new a new side of himself to the player. Well, this is the first time Professor Layton has received this treatment. I tossed around my ideas with Hino-san to sound out his opinion on how far I was allowed to go. And now, I can’t see Professor Layton as anything other than a playful character. I suppose this is another example of how you made the most of Takumi-san’s creativity. Also, I’d recommend this game to fans of Ace Attorney, because it’s Phoenix and Maya’s16 first outing in several years. Nothing’s changed in that time – they’ve been away, and now they’ve come back. I think players will feel that this title offers something new as well as something nostalgic, with plenty of familiar interaction between the characters to enjoy.16. Maya Fey: a spirit medium-in-training and Phoenix Wright’s assistant. This must be a long-awaited encounter for all their fans. Yes, and while that’s fun in itself, there’s also the “witch trial” element. Because this adventure takes place in a world where magic is real, the common sense and scientific research techniques that have been effective in the series up to now won’t work, and players will need to develop a new kind of logic. I do think this gives the game a completely new feel. There are other new elements, too, such as group interrogations, where a number of witnesses are cross-examined at once. What about players who’ve never played either of the two series? I think I can sum up my recommendation to those players by saying that Professor Layton vs. Phoenix Wright: Ace Attorney brings together two of the biggest series that are available on Nintendo’s handheld consoles. As such, people don’t really have a reason not to play this game! It’s certainly a title that everyone can enjoy, and one which reveals the charms of both the series from which it originated. If players were to give this game a try, find out that they like it and then go on to play the two original series as a result, I don’t think there’s anything that could make me happier, as a developer. I see. What do you think, Hino-san? I think it’s just like Takumi-san has said. When it comes to fans of the Professor Layton series, I feel really confident that we’ve managed to fill this game with Layton’s uniquely enjoyable aspects, right down to the tiniest detail. So you agree that this game can be played as the latest title in the Professor Layton series? That’s right. 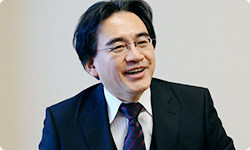 Though it features a new game world, one that hasn’t been seen in the main series, as well as some of Takumi-san’s unique tastes. I think that, with this title the Professor Layton series is evolving into something even more wonderful. What would you say to fans of Ace Attorney? I want to tell them that this is the real thing! With all due respect to everyone at Capcom, I consider myself Ace Attorney’s biggest fan, and I think this title is even more like Ace Attorney than the other titles. There’s no doubt in my mind that this game is the latest entry in that series too. After playing the game, I really feel able to say that. This is a game that Takumi-san got fully-immersed in the development of, and is therefore a “real” Ace Attorney game. The fact that people are expecting big things from it makes me happy. I see. Finally, what would you say to people who’ve never played either of the series? Do you feel, though, that if there are players who’ve always been a bit interested in the series, but never had a chance to play, this is the ideal place for them to start? Bringing together two titles as it does, this collaboration was always going to have a huge impact. As a result, it would be easy to get caught up in the hype surrounding it. But there’s more to this game than novelty, isn’t there? In terms of content, too, it makes the most of the best points from both series to become something that’s on another level, with an all-new charm of its own. That’s right. One more thing I hope is that people play to the end of the game and listen to the ending song. It’s a kind of symphony, one that fuses together imagery from songs from both series. In a certain sense, that song is a symbol for the whole project, isn’t it? You know, listening to you both speak today, I really get the sense of being glad that this collaboration happened. I agree with you. Working with Capcom and experiencing their game-making know-how for myself allowed me to learn a lot. I also got to sample the magic of Takumi-san’s creativity first-hand. I think that was very stimulating for me, as a creator myself. The “vs.” in the title certainly applied to the development process! (laughs) Genuinely though, the thing I feel most strongly this time was that it was really wonderful to work with Takumi-san on a project. What do you think, Takumi-san? The most important thing I learned during this project is that letting people from other companies into my working process allows me to take a more objective view of the things I create. 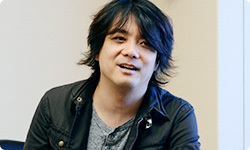 Of course, I was also really stimulated by Hino-san’s plans, his way of thinking, and his creative ideas. 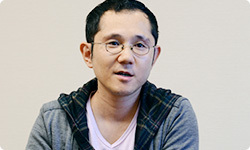 When I listened to Hino-san speak, I thought that the process of connecting one’s personal creative impulses with what you think the market wants was a really interesting one. Consumers’ minds cannot be moved by us just creating things that seem like they’d sell. If you don’t find a connection between that and your internal desire to create, the results won’t be good. That’s certainly something I learned as well. In a sense, I feel it’s a matter of recognising that even the tiniest detail can be viewed in countless different ways, and appreciated from different angles. There are all sorts of collaborations going on in the world, but I don’t think there can be many that have combined elements of both contributors as successfully as this title does. As a former game creator myself, I really enjoyed listening to you both today. At first glance, this project looked like a reckless challenge, but it’s clear to me that, when you look back, you can now even say that fortune brought you together. I feel sure that this is something you’ll be able to make use of in your future endeavours. I really hope that fans of both series, as well as those who’ve never come into contact with either series, get to sample this “vs.” feeling. Hino-san, Takumi-san, thank you very much.